From Cathedral to lowly parish church the same system applies. As the fourteenth grows into the fifteenth and again into the sixteenth centuries, we get progressive skill in construction with methods of ever-growing ingenuity, combined with a corresponding economy of material, until, 136 in the later and debased Gothic, traceries become almost impossibly delicate in proportion and bewildering in the intricacy of their ornament, as at Westminster Abbey, for example. Fig. 136. 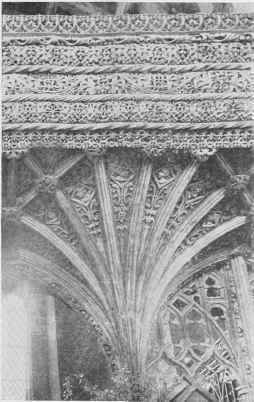 Part Of Oak Screen Doors From A Former Bishop's Palace At Exeter. - 7 ft. 10 in. high by 3 ft. 5 in. wide. Mid-fifteenth century. - Victoria and Albert Museum. 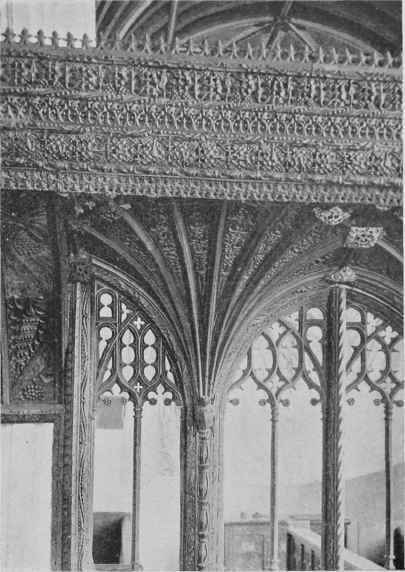 An account of colour decoration in Gothic clerical woodwork is, perforce, also one of the development of the ornament and construction itself. Whether colour and gilding were an integral part of the early work, or whether such decoration was applied as a super-refinement, after the climax of the carpenter and carver has been reached, it is not possible to say, after so much painting, whether original or of later date, has been removed. Fig. 137. Pilton, N. Devon, Parclose Screen. - 10 ft. high by 13 ft. wide. Mid-fifteenth century. Fig. 138. Bovey Tracey, S. Devon, Screen. - Late fifteenth century. Fig. 139. Halberton, S. Devon, Screen. - I.ate fifteenth century. Fig. 140. 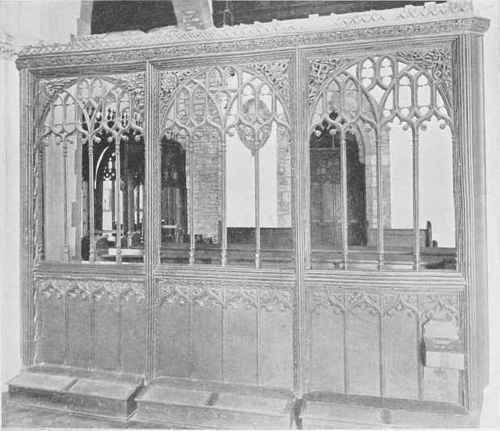 Chulmleigh, Devon, Screen. - Late fifteenth century. Fig. 141. Chulmleigh, Detail Of Base. Fig. 142. 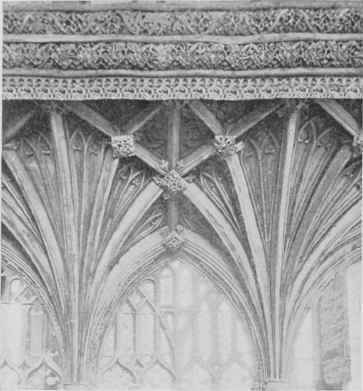 Chulmleigh, Detail Of Vaulting. Fig. 143. 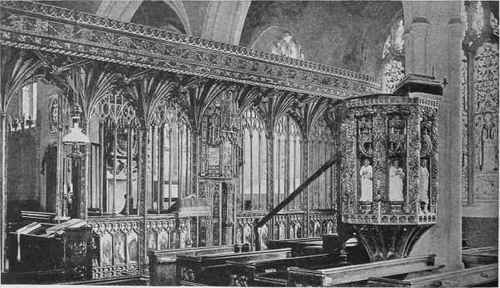 Coldridge, Devon, Screen. - Detail of vaulting. Late fifteenth century. 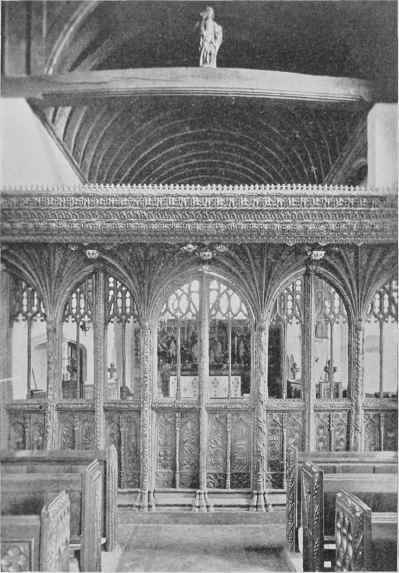 In the little parish church of Culbone in Somerset is the little fourteenth-century screen illustrated here in Fig. 96. Another example is in Appledore Church, as far removed as the Romney Marsh, of very similar detail, which shows that the type must have been general at this date. The main frame of these simple screens consists of a till, posts and a head or upper plate, all mortised and tenoned together. The heavy traceried heads are tenoned to the balusters instead of being grooved between vertical mullions in the later fashion. These heads are, therefore, cut from the one piece of timber, pierced with circles and with simple patterns, without cusping. In some of these early screens the shafts are turned; in others, as in this example, they are moulded. There is rarely any other decoration beyond a crude moulding of the framework. 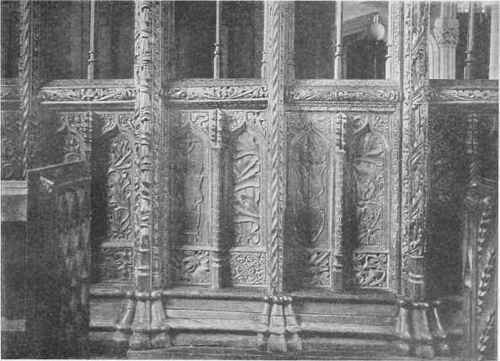 In the fourteenth-century screen at Lavenham, Fig. 97, we have a marked advance in constructive methods, but Suffolk at this date was in a far greater state of artistic development than Somerset. Here the moulded mullions are crested with crocketted pinnacles tenoned between head-beam and transom, with crocketted ogival arches abutting on to them and bracing them firmly together. These arches, at their centres, are tenoned into the beam above, and are filled with tracery supported on a central slender shaft. The detail can be studied in Fig. 98. At Atherington, Fig. 99, the tracery is grooved into the mullions, both the ogee and the tracery being cut from the solid. Interlaced cusped arches are introduced into the lower panels, supported on moulded ribs which mask the panel-joints. 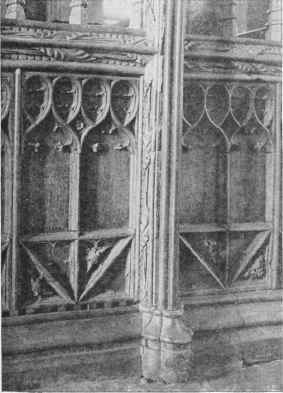 It will be noticed that all these early screens of this type have square heads, the mullions being mortised directly into the beam, and with traceried spandrels in the upper portion of the openings only. In some rare instances these openings were completely filled with tracery. Fig. 144. 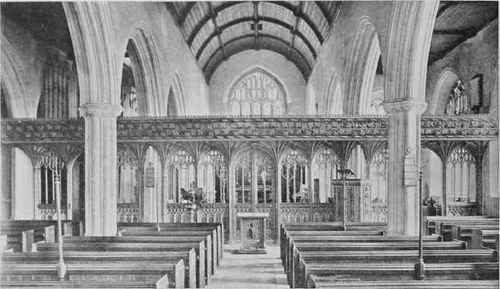 Lapford, Devon, Screen. Fig. 145. 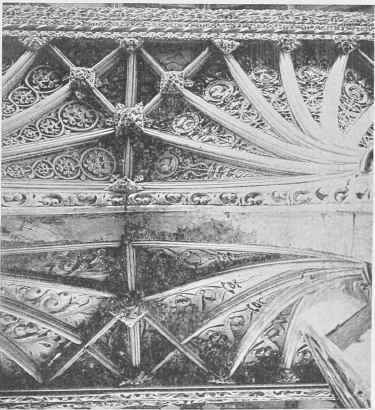 Lapford, Devon, Detail Of Vaulting. At Grundisburgh, Figs. 100 and 101, a further advance in construction is to be noted. Alternate mullions are carried through from cill to head in the form of posts with the intermediate mullions acting as framing members, dividing each bay into two lights or openings. The tracery, carried up to the head, is taken through these intermediate mullions, which are forked over it. The crocketted ogival arches are applied, pegged to the tracery, and supported on abutments formed on the mullions. Unlike Lavenham and Atherington, the entrance from nave to chancel is through a finely decorated archway. The chancel begins, at this date, to lose its former rigidly exclusive character. The chapel screens at Barking, Figs. 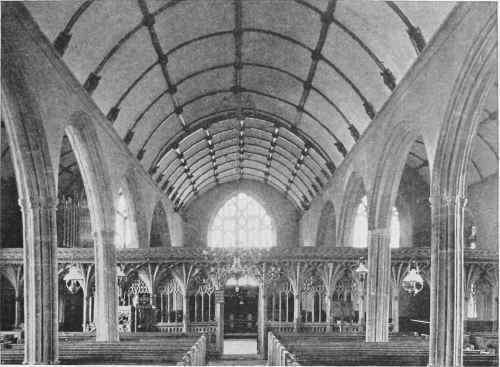 102 and 103, show a further development in design, the tracery with its applied ogee arches being arranged in double and triple pendentive form, although the original carved finials are missing. The lower panels are enriched with applied tracery, grooved into the posts and divided by an applied moulded rib. At Lavenham, Fig. 104, the traceried heads are cut from the solid, with applied arched ribs, grooved into the mullions. In the N. aisle parclose screen, Fig. 105, of somewhat earlier date, the tracery is pinnacled or gabled in a manner reminiscent of many of the stall canopies of the period. The applied mouldings to some of the gables are missing and all the pendants have disappeared. Apart from the strong suggestion of foreign influence in these two examples, the Gothic is here fast losing its former logical character, and is degenerating into mere ornament. 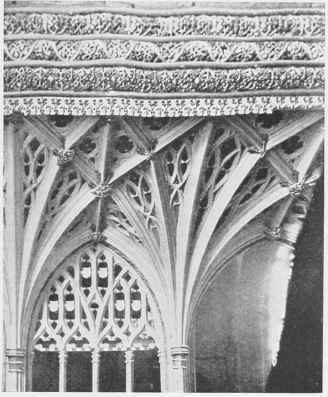 The stall canopies of All Saints, Hereford, Fig. 106, will show the standard reached before this decline. Here the ogival arched heads break forward and form niches, richly traceried above and crocketted below. There is the straight beam above, with both shafts and pinnacles tenoned into it. There is not the massive grandeur which is noticeable in the design of the Winchester stalls. where the canopies are hewn from great masses of timber. Here the effect is achieved by constructional methods, although with some loss in dignity and splendour. Fig. 147. Swimbridge, Devon, Screen. - Mr. Fredk. Sumner, Photo. Fig. 148. Swimbridge, Devon, Detail Of Screen Base. - Mr. Fredk. Sumner, Photo. Fig. 149. 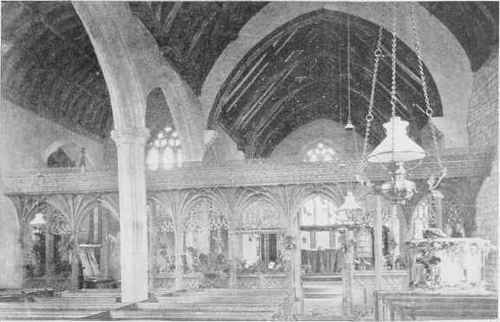 Swimbridge, N. Devon, Chancel Screen. Fig. 150. 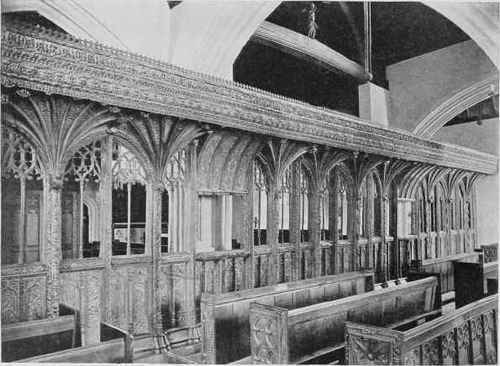 Swimbridge Chancel Screen. - Detail of vaulting. - Knight, Photos.